When analyzing compounds with multiple ionization positions using the ESI method, multi-charged ions are generated. For example, even if a compound has a molecular weight of 10,000, if there are ions with a valence of 20, they are detected with an m/z ratio of 501, whereas ions with a valence of 10 will have an m/z ratio of 1,001. As a result, compounds with molecular weights exceeding the measurement range of a mass spectrometer can be measured. This software calculates the molecular weight of a target compound based on data obtained from a multivalent ion MS spectrum. 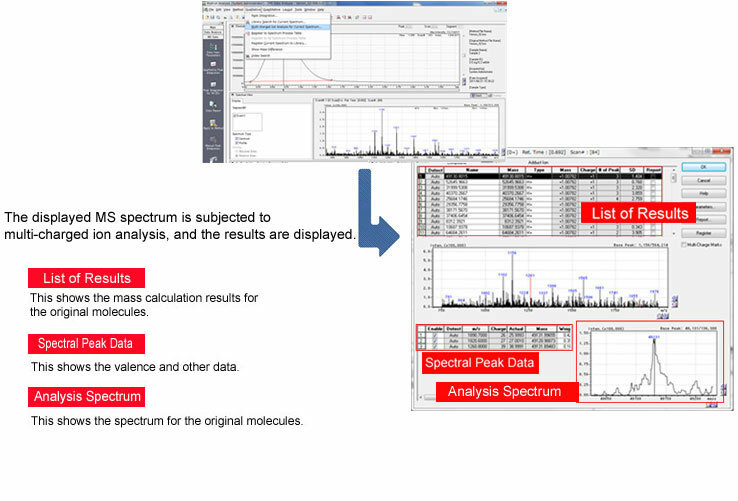 Display the MS spectrum and select the menu to perform the multivalent ion analysis. 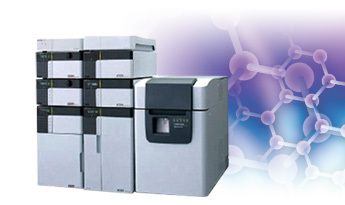 MS spectra can be analyzed in succession, increasing analytical efficiency. In addition, spectral data from the Spectrum Process Table is linked to the multi-charged analysis results, providing for a smooth sequence of procedures from analysis to report creation. 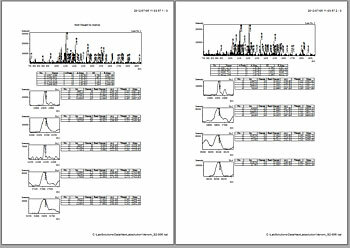 Results can be printed in a LabSolutions report containing the sample data. In addition, the spectral data can be selected, enabling reports to be output on just the target compounds. The spectral smoothing, peak detection method, and type of adduct ions can all be changed according to the analysis.